Every device connected to the Internet needs an IP (Internet Protocol) address – a unique number that identifies a device and allows it to be located on a network. For the system to work, every connected device must have a unique address. It is therefore extremely important that the allocation of IP address space is accurately registered and managed in order to maintain the smooth functioning of the Internet. The Internet began as an experimental project at the end of the 1960s that interconnected a small number of research institutions. Back then, the global IP address registry was simply a list of IP address ranges and details of the organizations to which these addresses had been allocated. As the Internet began to expand, more and more organizations needed IP addresses to get online and this list grew. In 1998, the function was formalized with the creation of the Internet Assigned Numbers Authority (IANA). 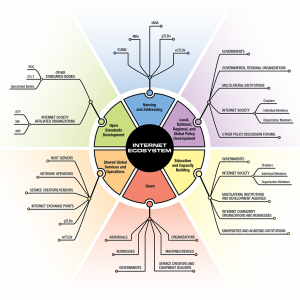 Many organizations contribute to make the Internet what it is today. ARIN – Canada, the United States, and Caribbean and North Atlantic islands. The five RIRs are not-for-profit organizations which are entirely self-funded by their Members and those that use the resources. They operate as industry self-regulatory bodies and their unique, open structures encourage direct participation by any interested party through consensus-driven, bottom-up decision-making processes. This framework has provided an Internet number resources management system that is scalable, effective, stable, open, and fair. This system has been critical to the successful growth of the Internet. In addition to the management and allocation of Internet number resources, the RIRs are engaged in local, regional and global Internet policy development and governance activities and are key players in the worldwide Internet eco-system. They also provide training, support infrastructure development and facilitate capacity building throughout their respective regions. The RIRs work independently within the regions they serve. Each region is clearly defined and there is no overlap between RIRs: they do not operate in competition with each other. They cooperate and coordinate their activities with each other and leverage common frameworks. As of October 2015, three of the RIRs – AFRINIC, LACNIC and APNIC – collaborate as part of the Seed Alliance. A fourth RIR, the RIPE NCC, serving Europe, the Middle East and parts of Central Asia, has expressed interest in becoming part of the Seed Alliance. The inclusion of a fourth RIR will benefit the Seed Alliance with additional funding and will increase global exposure.